I always like to hear what running products other runners use, so I thought I’d share some of my favorites here. All of these favorites are coming to Boston with me (some came along for the ride last year, too), and they have more than proven their worth. First up is my absolute favorite running shorts. Ever. I bought a pair of Oiselle Roga shorts a few years ago, and quickly bought a second pair, because it became immediately apparent that I was going to want to wear them every time I ran. I have worn these shorts on countless training runs, and through two full marathons (Gansett and Boston), and many half-marathons. They are my go-to shorts, for several reasons – they’re insanely comfortable. So lightweight, even on super hot and humid days. 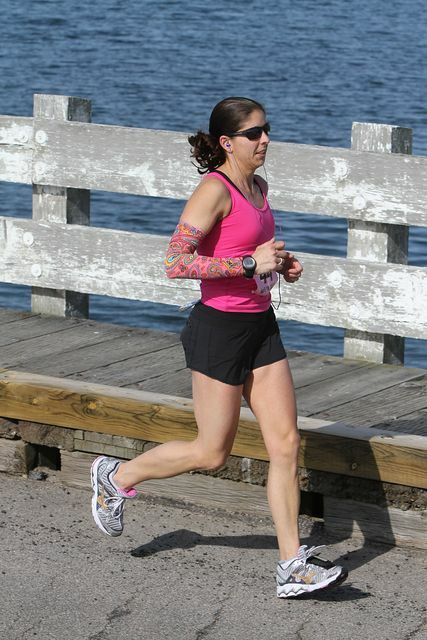 They’re flattering – none of the poufiness of some running shorts. They have a pocket – a real one, not a teeny tiny microscopically small one. And last but not least – they’re seriously well-constructed. I’ve had these two pairs for 3 years, and they honestly show not a single sign of wear and tear. And I wear them a LOT. They get washed at least once a week; sometimes twice. So really – get yourself a pair – now. 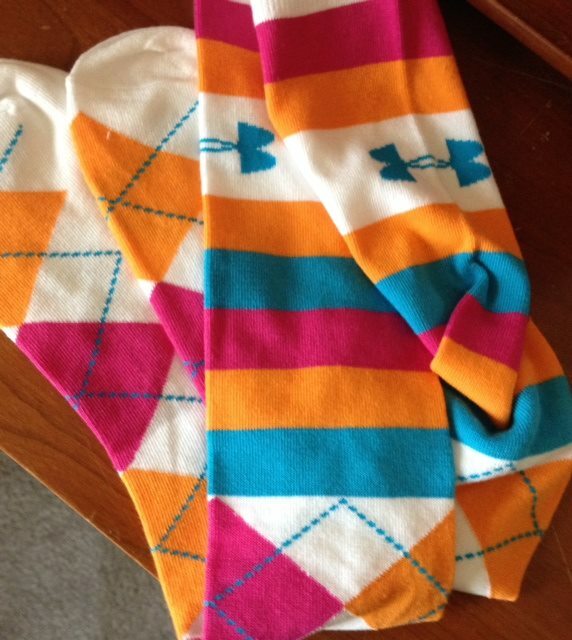 The next recommendation is not for any particular brand, even though the socks pictured here happen to be Under Armour brand. It’s just a genius tip I found online years ago, and one I’ve shared with many runners since, all of whom were thrilled for the info. I love a nice pair of armwarmers (Oiselle has some snazzy orange ones that are on my wishlist – they’ll go very nicely with the orange Boston gear I plan to purchase after the race), but sometimes for a long race, I want to have the option to toss my armwarmers aside when I’m done with them – and I’m not going to do that with a nice pair that I’ve spent good money on. So instead, I buy the most fun, colorful, interesting $2 or $3 knee socks I can find, cut the toes off, and I have instant, disposable armwarmers. This pair is definitely one of my favorites, and I’ll be a tiny bit sad to toss them to the side of the road, but will also be glad to not have to stash or carry anything. Since being diagnosed with exercise-induced anaphylaxis a little over a year ago, I have to always run with my phone and epi-pen, which has meant I’ve had to get creative in how I carry things on the run. If I’m not carrying a lot of other things, like Gus, my Auvi-Q epi-pen fits perfectly in the pocket of my Roga shorts. 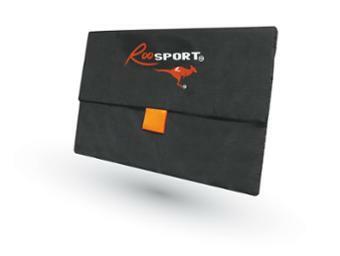 On race day, though, I need a little more flexibility, so I also carry some small items in my Roo Sport. It’s an ingenious design that eliminates the need for a belt of any sort. I’ve tried various belt-type products, and found some that were ok, but I still don’t like having anything around my waist, so the Roo Sport has been the perfect solution. Gu is my fuel of choice during the race, and I finally tried the Salted Caramel, and much like many others, I’m completely hooked on the stuff now. I alternate between that and the Espresso Love, and it’s almost as if I’m having a caramel latte as I run. Almost. I’ve gone through more armbands than I can count, and some have definitely worked out better than others. For convenience and functionality, though, none beat the Momentum by X-1 Audio. I used – and loved – their waterproof armband and headphones when I was doing a lot of pool running while injured, and figured if those were so great, their other products probably were, too. The Momentum is a great design. It is a little tricky getting my phone into the sleeve with its Otterbox case on, but with a little practice, I’ve gotten the hang of it – and without the Otterbox case, it wouldn’t be an issue at all. And once it’s in, I know it’s safe. 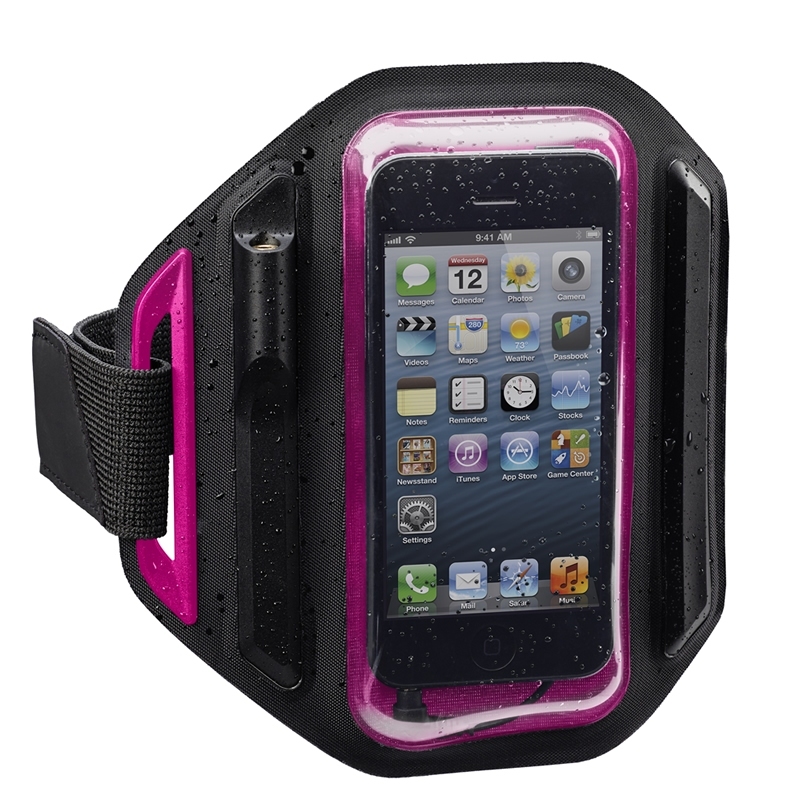 I just used it during an extremely wet 20-mile run (torrential downpours and Flash Flood warnings wet), and my phone stayed dry. The headphone connection is ideal, too. Rather than having to thread your headphone cord in through the case in an awkward way, there’s a connector inside the case – you plug that into your phone, and then the headphone cord itself is easily attached via a port on the outside of the case. So much simpler that way, and less worry about the cord connection getting bent or pulled on awkwardly. As for the rest of my Boston gear – I’m still deciding between my two new pairs of shoes. 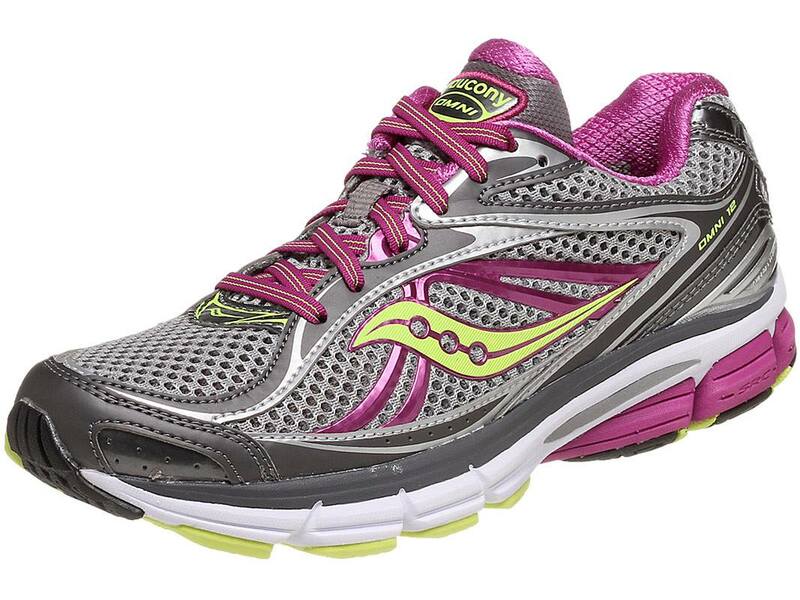 I love the Brooks Adrenaline, but right now I think I’m leaning toward the Saucony Omni. I wore the Brooks for two long runs and they felt good, but I wore the Sauconys for my most recent long run and they felt even better. I’ll take the Sauconys for one more long run this weekend and make the final decision after that. I may be in the market for a new watch, as my Garmin is on the fritz. I love it – the 405 – and have run many a mile with it, but it’s been a little glitchy since my October half (when it died at the starting line), and I can’t be relying on a glitchy watch to get me through the Boston Marathon. I’m very interested in the Bia, but not certain if it will be ready in time – it’s still in development right now, and shipping times are listed at 4 – 6 weeks. It looks pretty amazing, though, and I’m definitely intrigued. 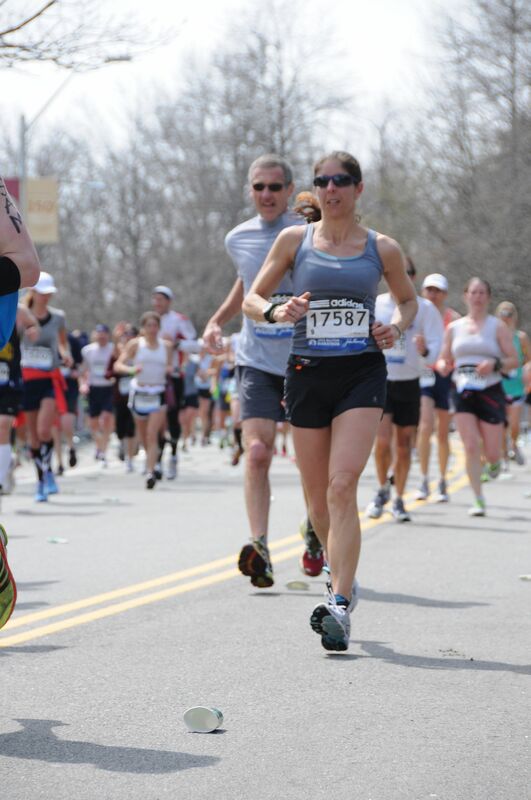 And as long as the weather cooperates, I’ll be wearing – with pride – my Boston 2013 shirt. I may wear it even if the weather doesn’t cooperate. What are a few of your favorite running-related things? All great things! Some of them new to me and I will have to give them a try. I am patiently waiting for my Bia. I pre-ordered mine before it was even in production and it should be here any time now. I will let you know what I think. 2. Your sock/arm warmer idea just changed my life. 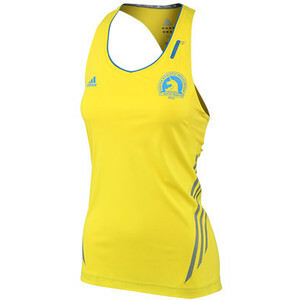 This is my first Boston & I’ve been trying to figure out what to wear/dispose of at the start line. 3. I think I’ll be rocking the blue Oiselle distance shorts! Where do you keep all your GU w/ only 1 pocket? In the RooSport? That thing looks amazing…do you run w/ the large or small one? GUs on your waistband? You are full of creative ideas! 🙂 Thanks for the tips.